“Imperialist powers have always labeled as terrorists the people who fight for their right. Irishmen were terrorists until they signed an agreement. Abbas was a terrorist. Now, he is a friend,” Mohamed Hassan, former Ethiopian diplomat in Washington, Beijing and Brussels. “Israel sees Islam as the greatest danger to its dominance over the Middle East, itself built on cruelty, violation and oppression,” – Professor Benjamin Beit-Hallahmi (Haifa University). The Ethiopian Muslim majority is sick of the US-Israel backed Meles Zenawi crime dynasty and want regime change. Tens of thousands of Muslims and Christians are demonstrating in various cities especially the country’s capital Addis Ababa against the Meles Zenawi regime. The Ethiopian Orthodox Tewahedo Church’s Holy Synod in exile, Archbishop Abune Melketsekik, and other church leaders have called on the people of Ethiopia to boycott all businesses that are affiliated with dictator Meles Zenawi’s ruling party, TPLF. Meles Zenawi, the chairman of the Tigray People’s Liberation Front (TPLF) militant group, is half Eritrean and naturalized Yemeni. He maintains very close relations with both Tel Aviv and Washington. Meles’ legal adviser, Fasil Nahom is half Eritrean and half Jewish. Meles Zenawi as country’s prime minister visited the Zionist entity in 2004 where he was praised a “friend of Israel” by then Israeli prime minister Ariel Sharon. There is a 125,000-strong Ethiopian Jewish community in Israel whose members are routinely targeted by the racist Jewish majority. The Solidarity Movement for a New Ethiopia and several other groups have asked the International Criminal Court (ICC) to investigate Meles Zenawi for the 2003 genocide of the Anuak people of the Gambella region in Ethiopia. However, ICC Prosecutor, Luis Moreno-Ocampo has refused to take an action in this regard. The Zionist entity’s collaboration with anti-Muslim Ethiopian regimes goes back to King Haile Selassie rule. Selassie’s 3,100-strong ‘Emergency Police’ was trained and supplied with arms by the Israeli armed forces and Mossad. It was in 1971 when Gen. Haim Bar-Lev visited Ethiopia – two strategic islands (Halep and Fatima) were opened for the Israeli Navy. Late Israeli Gen. Matti Peled had admitted that it was Israeli protection which saved the King from three assassination attempts. When Haile Selassie was overthrown by a Marxist coup lead by Mengistu in 1974 – the Zionist regime changed its loyalties to continue their genocide of Muslims in both Ethiopia and Eritrea. Tel Aviv increased its military and diplomatic links with the new Marxist-Leninist regime. The Israeli cooperation has continued under the Ethiopian prime minister Meles, a horrific human rights abuser, in power since the fall of Marxist-Leninist dictator Mengistu Haile Mariam. Muslim presence in Abyssinia (currently Ethiopia) goes back to the early 7th century when its powerful Orthodox Christian King Ashama (Nejash in Arabic) converted to Islam during the Prophet Muhammad’s (pbuh) life time (in 616 CE). Thomas C. Mountain, an independent journalist living in Eriterea, recently wrote an article, entitled ’Islam Ignites in Muslim Majority Ethiopia ‘ exposing Washington’s strategy to maintain dictatorships in the African continent. While Ethiopia is historically portrayed as a Christian country, in reality, most Ethiopians are of the Islamic faith. Starting with the Oromo people, who make up at least half or more of the Ethiopian population, 40 million or more, and are almost entirely Muslim; and then adding the Afars and Somali people of the Ogaden, it becomes indisputable that Ethiopia is a majority Muslim country. So when for the first time in modern Ethiopian history the leadership of the Islamic community called for the overthrow of the government, and are joined in this call by the leadership of the Ethiopian Christian Orthodox Church, it means only one thing, that the end of the hated USA backed Meles Zenawi regime is finally in sight. With insurgencies growing in size and strength throughout Ethiopia, in the east, south, west and north; soaring inflation and economic hardships; and now the unprecedented politicization of the leadership of the Muslim community, the consensus of those in the know in the Horn of Africa is that the foreign funded rule of Meles Zenawi may last a year, a year and a half at best, possibly even less. And once Meles is driven from power and his military either destroyed or having joined the uprising, who will the USA have left to enforce Pax Americana in the strategically critical Horn of Africa? You probably weren’t aware that the protesters warned the university that they were going to be protesting two weeks in advance, were you? The campus, and campus police, had two weeks’ notice to plan for this, and yes, on day one, one question they addressed was, “What if the protesters set up an Occupy encampment?” Two weeks in advance they planned, well, if they do that, then we’ll send in police to remove the tents, and to arrest anybody who tries to stop them. Now, under California law, when planning an operation like this, there’s a checklist they’re supposed to follow when writing the operational plan, specifically to make sure that they don’t forget something important. Had they done so? They would have avoided all four of the important steps they screwed up. When asked about it? Nobody involved was even aware that that checklist existed. Chief Spicuzza “thought she made it clear” more than once that no riot gear was to be worn and no clubs or pepper sprayers were to be carried. What Lieutenant Pike said back to her, each time, was, “Well, I hear you say that you don’t want us to, but we’re going to.” And they did, including that now-infamous Mk-9 military-grade riot-control pepper sprayer that he used. Oh, funny thing about that particular model of pepper-sprayer? It’s illegal for California cops to possess or use. It turns out that the relevant law only permits the use of up to Mk-4 pepper sprayers. The consultants were unable to find out who authorized the purchase and carrying, but every cop they asked said, “So what? It’s just like the Mk-4 except that it has a higher capacity.” Uh, no. It’s also much, much higher pressure, and specifically designed not to be sprayed directly at any one person, only at crowds, and only from at least six feet away. The manufacturer says so. 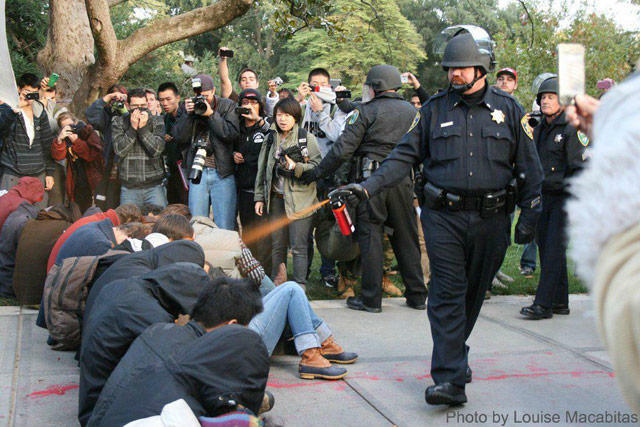 The person in charge of training California police in pepper spray says that as far as he knows, no California cop has ever received training, from his office or from the manufacturer, in how to safely use a Mk-9 sprayer, presumably because it’s illegal. But Officer Nameless, when he wrote the action plan for these arrests, included all pepper-spray equipment in the equipment list, both the paint-ball rifle pepper balls and the Mk-9 riot-control sprayers. Once again, Israel is recruiting university presidents and chancellors. I wonder how these academics can justify not meeting with Palestinians, who have suffered diverse academic assaults from Israel – from ethnic/religious discrimination to their schools being shelled and students killed – while they’re over there. Think of the astronomical wealth of the Israel Lobby, which can fund a multitude of such trips. JERUSALEM (JTA) — A delegation of U.S. university presidents is in Israel to explore opportunities for academic and research collaboration. The seminar, which ends July 9, is sponsored by Project Interchange, an educational institute of the American Jewish Committee. A president of a historically Black college and university, Spelman College President Dr. Beverly Daniel Tatum, is participating in the program the first time. The delegation was scheduled to meet with senior Israeli government and academic officials and leaders of civil society across the social and political spectrum, and to travel to the West Bank to meet with Palestinian leaders. They were scheduled to network with their counterparts at Tel Aviv University, Hebrew University and the Weizmann Institute, among others. The group was also set to travel to Sderot, to view the city that has been under fire from rockets from Gaza. “As chancellor of a top American public research university with a strong international presence and aspirations to build on our existing global relationships, it is important that that I have a deep understanding of Israel and its neighbors,” said seminar delegation chair, University of California Davis Chancellor Linda P.B. Katehi. Some may recall that Katehi was part of scandals at the University of Illinois awhile back in which rich, well-connected students were getting admissions preferences over better qualified applicants, and at Davis, where police pepper sprayed peaceful students. ……Grassroots Zionist action groups were organized with more than 400 local committees under 76 state and regional branches. AZEC funded books, articles and academic studies; millions of pamphlets were distributed. There were massive petition and letter writing campaigns. AZEC targeted college presidents and deans, managing to get more than 150 to sign one petition. I think there is an interesting contrast between the University of Virginia situation and that of Linda Katehi, chancellor here at UC Davis. We now know from the Reynoso report (discussed here) of Katehi’s complicity in the violent act against the innocent students, and her mendacity about her role in the pepper spraying incident; for this she does deserve to be, and ought to be, fired from her position. Yet nary a word to this effect has been heard from the UC Board of Regents nor the President of UC. The campus Academic Senate did finally censure Katehi, but stopped short of calling for her to be fired, which had been recommended by the Senate’s committee that had looked into the incident. As we head off this week to our summer vacations, it is apparently business as usual in the Chancellor’s office. One of our longstanding arguments about the folly of American policy on Iran-related sanctions is that it is incentivizing rising powers like China and the other BRICS countries (Brazil, Russia, India, and South Africa, along with China) to develop alternatives to U.S.-controlled mechanisms for conducting, financing, and settling the international exchange of goods, services, and capital. As the latest sets of U.S. and European Union sanctions against the Islamic Republic were going into effect, Neelam Deo (a former Indian diplomat who now directs Gateway House, the Indian Council on Global Relations) and Akshay Mathur (head of research and geoeconomics fellow at Gateway House) published a brilliant opinion piece in The Financial Times outlining precisely how such alternative mechanisms are likely to emerge, see here. Deo and Mathur acknowledge that “activating these regimes will require adjustments. China’s reserves are in dollars; it will have to balance preserving that value with internationalizing the Renminbi—a stated Chinese goal achievable under a new system. External partners like Iran will have to make an effort to increase trade with BRICS to avail of the new system’s benefits. Net importer India will have to offer more competitive products and services within BRICS. In return, net exporters China and Russia may have to patiently hold weaker currencies like the Rupee until a balanced equation is achieved. Read their article and get a glimpse at what is likely to be an important part of the future. Sanctions as Trade War prelude: Iran tankers heading home after selling stored oil? Remember the reports that Iran was storing oil in its tanker fleet because it couldn’t sell the oil? Commodity markets shot higher for the second time in three days on Tuesday, with oil prices leading the way as they posted one of their biggest, broadest rallies ever as bellicose rhetoric from Iran stoked Mideast supply worries. Thirty-three ships in the 40-strong fleet of crude carriers controlled by Tehran-based NITC, a tanker company owned by Iranian pension funds, provided signals within the past month, IHS Inc. (IHS) data compiled by Bloomberg showed today. That compared with 21 in the corresponding period to June 11. China, the biggest buyer of Iranian crude, was exempted June 28 from U.S. sanctions that took effect that day. Japan, Singapore and India are among 20 nations that also received waivers. Iran, which faces an EU embargo begun July 1, raised storage on tankers to as much as 42 million barrels by the end of May, the International Energy Agency said June 13. It also stored in the second quarters of 2008 and 2010. You know, I’m no energy economist, but this sounds like a coup for Iran. In any case now is a good time to bring up something — I brought this up before on the Gulf2000 list, and the Leveretts have recently briefly mentioned it too — but the US sanctions on Iran are actually illegal, and may lead to trade wars. And ironically, it was the US’s effort at protecting Israel that has made them illegal. See, after their wars with Israel in the late 1960’s and more specifically after the 1973 war, the Arabs imposed sanctions on Israel through the Arab Oil Embargo. These included “secondary sanctions”. What does “secondary” here mean? The sanctions not only prohibited their own countries from having commercial relations with Israel, but also banned doing business with with any foreign business anywhere that did business with Israel. In other words, they all agreed to not do business with any company — whether French, German or whatever — that was also doing business with Israel. If these companies wanted to do business with the Arabs, they had to pull out of Israel. The US was naturally quite opposed to this and made a big fuss about the “freedom of trade” etc. It also complained a lot about how the Arabs were trying to force the world to live by their laws and so were “imposing sovereignty” on others through the “extra-territoria” applications of their laws. The US passed laws domestically — called countering laws or blocking laws — that responded to the Arab secondary sanctions by making it illegal for any American firm to respect the Arab’s demand of not doing business with Israel. Laws were passed at the international level too, and trade rules established that prohibited secondary sanctions. In the end the Arabs essentially lost this attempt at isolating Israel through secondary sanctions. Now, thanks to AIPAC influence-peddling, it is the US that is playing the role of the Arabs, and Iran is playing the role of the Israelis. The US is imposing secondary sanctions on Iran. According to the US sanctions, no American company can do business with Iran, and no foreign company can do business with Iran and do business with the US. If a foreign company does business with Iran, it is banned from doing business with the US. And since the US is a major source of business, lots of foreign companies have decided to pull out of Iran. Well, here’s the irony. The Americans and the Europeans don’t generally import a lot of oil from Iran. India and China certainly do, and in general the removal of Iran’s oil from the markets means a significant rise in oil prices, somethign that up-and-coming powers do not favor. Brazil has a nuclear power program that includes enrichment, and has been trying to prove it “is able to defend its interests in the context of economic globalization.” Russia is itself trying to stay assertive in the face of a US that won the Cold War. They take one look at what’s being dealt out to Iran, and they wonder: could we be next? And if they decide to oppose these sanctions using existing international trade mechanisms, which would include them passing their own countering or blocking laws, then we have a heated trade-war on our hands. The U.S. Administration at the time attempted to ban such shipments from anywhere in the world if the goods originated from the U.S., used U.S. technology, or were to be exported by subsidiaries of U.S. corporations. A PTIA Order was made and a number of directions were given to prevent certain corporations from complying. Although most of the corporations were British, at least one company was American, and was prohibited from complying in respect of its exports from the U.K. The U.S. ultimately rescinded the relevant regulations controls to shipments by non-U.S. companies of goods for use in the Trans-Siberian pipeline. The U.S. Administration at the time attempted to ban such shipments from anywhere in the world if the goods originated from the U.S., used U.S. technology, or were to be exported by subsidiaries of U.S. corporations. A PTIA Order was made and a number of directions were given to prevent certain corporations from complying. Although most of the corporations were British, at least one company was American, and was prohibited from complying in respect of its exports from the U.K. The U.S. ultimately rescinded the relevant regulations. And apart from domestic blocking laws, there are international trade laws and rules that prohibit secondary sanctions too. The World Trade Organization for example has a set of specific rules and procedures which the Europeans invoked against the US back in late 1996 when the US Helms-Burton law attempted to black-ball European firms doing business in Iran or Cuba. It appears that today the Eurpeans and US have reached a sort of political deal with each other which involves Europe not invoking the same provisions and challenging the legality of US secondary sanctions on Iran… but how long will that last, and when will various countries decide to stop cooperating? July 5, 2012 Posted by aletho | Economics, Timeless or most popular, Wars for Israel	| Iran, Israel, Sanctions against Iran, United States | Comments Off on Sanctions as Trade War prelude: Iran tankers heading home after selling stored oil? An Israeli journalist who drew on leaked army documents to report the deliberate assassinations of Palestinian leaders was convicted on Thursday, but spared jail time in a plea bargain. Uri Blau of Haaretz newspaper will do four months community service after confessing to reduced charges of possessing classified information without authorization but “with no intent to harm national security,” Israel’s State Attorney’s Office said in a statement. Prosecutors had earlier stated Blau could face more serious espionage charges. That provoked protests from journalists who argued Israel’s reputation for media freedom was at stake. Blau reported in 2008 that top army officers in the occupied West Bank had given shoot-to-kill orders to troops chasing Palestinian gunmen. The front-page story was based on documents given to Blau by former army conscript Anat Kamm, who had downloaded them, and hundreds of others, from her computer while a clerk with the military’s high command. Kamm was jailed for four and a half years in October under a separate plea bargain. Human rights groups have criticized Israel’s policy of assassinating Palestinian leaders since the early days of a Palestinian uprising in 2000. Haaretz said charging Blau was “unfortunate and sets a precedent in terms of its ramifications on the freedom of press in Israel, and especially on the ability to cover the security apparatus.” Other Israeli journalists echoed the condemnation. Blau’s plea bargain is subject to formal approval by Tel Aviv District Court. A recent Reporters Without Borders study ranked Israel 92nd out of 179 countries in terms of press freedom, behind countries such as Congo, Kenya and Serbia. July 5, 2012 Posted by aletho | Timeless or most popular, War Crimes	| Arafat, Mahmoud Abbas, Mohammed Dahlan, Yasser Arafat | Comments Off on Who killed Yasser Arafat?